How is the movie organized? How does the opening montage use juxtaposition to introduce and contrast several key ideas and establish an historical context for the setting of the movie? How does the eventual winner of this fight accomplish this feat? 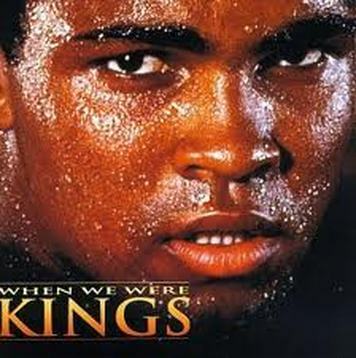 Research of the following people who figure into the "Rumble in the Jungle": Muhammad Ali, George Forman, Miriam Makeba, George Plimpton, Howard Cosell, Mobutu Sese Seko, Don King, B.B. King, James Brown, Norman Mailer, and Spike Lee. How does the tone and the film's setting in Zaire in 1974 show aspects of the following cultural and historical movements ~ the emergence of post-colonial Africa, the black pride movement of the late 1960s and early 1970s, and the American Civil Rights Movement? a technique in film editing in which a series of short shots are edited into a sequence to condense space, time, and information. View and discuss When We Were Kings. JOURNAL #6: WHEN WE WERE KINGS ~ Write 50 to 75 words on your responses to all eight of the essential questions above. Organize your writing into eight separate paragraphs.